If you’re a Respiratory Therapy student looking for head trauma practice questions, then you’ve come to the right place. That’s because, this study guide is loaded with some of the absolute best practice questions that can help you learn everything you need to know about head trauma. Head trauma is something you definitely need to be familiar with as a Respiratory Therapist and is a subject that you will definitely cover in your Pathology course. You can use this study guide to gain a good understanding of how to properly treat head trauma patients now and for years to come. Are you ready to get started? 1. What is the definition of a traumatic brain injury? It is the impairment of brain function which is the result of a mechanical force. 2. What is the epidemiology of a traumatic brain injury? It occurs in males twice as often as with females. 3. What is the cerebral perfusion pressure equation? CPP = MAP – ICP. 4. What is the Glasgow Coma Scale? It is an assessment with a standardized scale ranging from 3-15 based on eyes, motor, and verbal skills of the patient. 5. What is head trauma? It is any degree of traumatic brain injury resulting in a range of injury from scalp laceration to a headache to loss of consciousness to focal neurological deficits. It is any injury or surgical procedure performed on the skull and/or brain. 6. What are the clinical presentations of head trauma? The clinical presentations of head trauma are a headache, amnesia (retrograde most common), and loss of consciousness. 7. What is the diagnosis of head trauma? CT scans without contrast is one way to diagnose brain injury. Also, cervical spine x-ray can be considered if there are focal neuro deficits with cervical radiculopathy. 8. What are the effects of head trauma? Traumatic brain Injury (TBI), tumors, aneurysm, cerebrovascular accidents (CVA) and seizures are the most common effect of head trauma. 9. What are the causes of head trauma? Trauma to the brain causes hemorrhage and edema while “closed head” traumatic brain injury may lead to tissue swelling and increased ICP (>15-20 mmHg). 10. What are the effects of increased intracranial pressure (ICP)? Decreased cerebral blood flow, secondary ischemia and prolonged cerebral ischemia may lead to death. 11. What past medical history do patients of head trauma have? Tumors, headaches, cranial bleeds, trauma, seizures, hemiparalysis which is a paralysis on one side, slurred speech, the respiratory pattern is irregular (bradypnea or Cheyne stokes), level of consciousness shows altered breathing and a pupillary response is abnormal. 12. What special tests are performed on a head trauma patient? Glasgow Coma Score, CT, MRI and Pet Scans. 13. What is important to note in ICP Monitoring? The normal value is 5-10 mmHg. An increase on the pressure of the skull should be noted. 14. What oxygen therapy should be given to head trauma patients? 100% NRB, PaO2 – 100%, SpO2 > 95%, bag and mask valve, initially CO2 35-40mmHg and advanced airway if GCS is <8. 15. What forms of mechanical ventilation should be used for head trauma patients? Decrease PaCO2 25-30 *if worried about ICP, avoid hypercapnia, minimize mean airway pressures (decrease Vt, change RR, decrease PEEP), set low pressure and exhaled volume alarms and 100%, PEEP if you have to that starts at 2. 16. What medications should be given to head trauma patients? Fluid resuscitation and vasopressors to keep MAP > 75mmHg, barbiturates for sedation, Dilantin (Phenytoin) for seizures, mannitol to decrease ICP, and hypertonic Saline for posturing, unequal or non-reactive pupils. 17. What should you monitor for patients with a head injury? Arterial BP through A-line, ICP 15-20, CPP (cerebral perfusion pressure) ≥60 and SpO2 >95%. 18. What are some methods to decrease ICP? Decrease ICP by elevating head of bed 30-40 degrees, administers Benzodiazepine or propofol -Ativan, Xanax, etc., and neuromuscular blocking agent. 19. How to manage patients with head trauma? Lowering intracranial pressure, hyperventilation to PCO2 of 30-35 (vasoconstriction of cerebral vessels leading to decreased intracranial pressure), mannitol, elevation of the head of the bed, steroids are the wrong answer in this case as steroids used in spinal stenosis and spinal cord injury. Stress ulcer prophylaxis with PPIs. 20. What is a head injury? A broad classification that includes any trauma to the scalp, skull, or brain. 21. What are the causes of head injury? Motor vehicle crashes and falls are the most common causes of head injury. Other causes are firearms, assaults, sports-related trauma, recreational injuries, and war-related injuries. Males are twice as likely to sustain a TBI as females. 22. Deaths from head trauma occur at what three time points after an injury? Immediately after injury, within 2 hours of injury, and approximately 3 weeks after injury. 23. When do the majority of deaths occur after a head injury? The majority of deaths occur immediately after the injury, either from the direct head trauma or massive hemorrhage and shock. 24. What are the primary types of head injuries? Scalp lacerations and skull fractures. 25. What are scalp lacerations? Because the scalp contains many blood vessels with poor constrictive abilities, even relatively small lacerations can bleed profusely. The major complications of scalp lesions are blood loss and infection. Treatments are saline, suture, and pressure bandages. 26. What are skull fractures? Skull fractures frequently occur with head traumas. It may be closed or open, depending on the presence of a scalp laceration or extension of the fracture into the air sinuses or dura. Type and severity of a skull fracture depends on the velocity, momentum, and direction of the injury agent, and the site of impact. Specific manifestations of skull fracture are generally associated with the location of the injury. Major potential complications of skull fracture are intracranial infections and hematoma, as well as meningeal and brain tissue damage. 27. What are the types of skull fractures? Linear, depressed, comminuted, and basilar. 28. What is a linear skull fracture? A low-velocity injury causing a crack in the skull. 29. What is a depressed skull fracture? An inward depression of skull fragments, which may have debris mixed within the wound; like a golf club to the head. 30. What is a comminuted skull fracture? Also called as simple, or compound, comminuted skull fracture is a direct impact injury causing fragmentation of bone at fracture. 31. What is a basilar skull fracture? A fracture located at the base of the cranium, it carries a high risk of cerebrospinal leak and infection via a Dural tear in the ear or nose (Battle’s sign, periorbital ecchymosis). 32. What is a diffuse injury? Concussion is a minor, sudden, transient, and diffuse head injury associated with a disruption in neural activity and a change in the level of consciousness (LOC). The patient may not lose total consciousness. Altered LOC (< 20 minutes), GCS at least 14, retrograde amnesia, initial confusion, dizzy, irritable, HA; requires close observation (may not be hospitalized though); and not seen on CT.
33. What are diffuse injury signs? Include a brief disruption in LOC, amnesia for the event (retrograde amnesia), and headache. Manifestations are generally of short duration. 34. What is post-concussion syndrome? May develop in some patients (after diffuse injury) and is usually seen anywhere from 2 weeks to 2 months after the concussion. 35. What are post-concussion symptoms? Include a persistent headache, lethargy, behavior changes, decreased short-term memory, and changes in intellectual ability. 36. What needs to be done during diffuse injury discharge? At the time of discharge, it is important to give the patient and caregiver instructions for observation and accurate reporting of symptoms or changes in neurologic status. Involves actual tearing of brain tissue and often occur with compound fractures and penetrating injuries. Tissue damage is severe, and surgical repair of the laceration is impossible because of the nature of brain tissue. If bleeding is deep into the brain parenchyma, focal and generalized signs are noted. Prognosis is generally poor for the patient with a large intracerebral hemorrhage. The bruising of brain tissue within a focal area, and usually associated with a closed head injury. It may contain areas of hemorrhage, infarction, necrosis, and edema and frequently occurs at a fracture site. Patient prognosis depends on the amount of bleeding around the contusion site. Neurologic assessment may demonstrate focal findings as well as generalized findings. Seizures are a common complication. 39. When major head trauma occurs, what delayed responses may be seen? Hemorrhage, hematoma formation, seizures, and cerebral edema. 40. What are the complications of a TBI? Epidural hematoma, subdural hematoma, and intracerebral hematoma. 41. What is an epidural hematoma? It results from bleeding between the dura and inner surface of the skull. Neurologic emergency and is usually associated with a linear fracture crossing a major artery in the dura, causing a tear. It can have a venous or an arterial origin. 42. What is an arterial hematoma in a head injury? The middle meningeal artery lying under the temporal bone is frequently torn. Because this is an arterial hemorrhage, the hematoma develops rapidly. 43. What is another name for a serious form of a head injury? 44. What is a rule of thumb to remember about head trauma? It refers primarily to craniocerebral trauma, which includes an alteration in consciousness no matter how brief. 45. What does the Glasgow Coma Scale Measure? It is a reliable and quantitative tool that assess the level of consciousness in 3 areas. It assigns numerical values to the 3 areas to give you a total score. Areas include eye opening, motor response, and verbal response. They have total points of 15 for a fully alert normal person and < 7 points for a coma. 46. What does the Glasgow Coma Scale Assess? It assesses the functional state of the brain as a whole. It is possible over time to plot the score on a timeline to see if the person is stable, improving, or deteriorating. 47. What does the LOC Assess? Arousal, wakefulness, awareness, and orientation. 48. What things do you ask a patient with a head trauma injury? Person: name, occupation, etc. ; Place: where the person is, nature of the building, city, state, country; Time: days of the week, the number in months, years; and, situation: why are you here. 49. When is a patient considered alert and fully conscious? Readily aroused, fully aware, and responds appropriately without delay. 50. When is a patient considered lethargic? Slow, sluggish, may be somewhat disorientated, and agitated but follows simple commands with decreased movements, and fuzzy thinking. 51. When is a patient considered obtunded? Difficult to arouse, sleeping most of the time, marginal cooperation, mumbling, incoherent, and acts confused when aroused. 52. When is a patient considered stupor or semi-coma? Very vigorous tactile stimuli required, incomprehensible sounds, only groans, and responses to pain by withdrawing body part. 53. When is a patient considered comatose? Completely unconscious, no response to pain, or external stimuli. So there you have it! 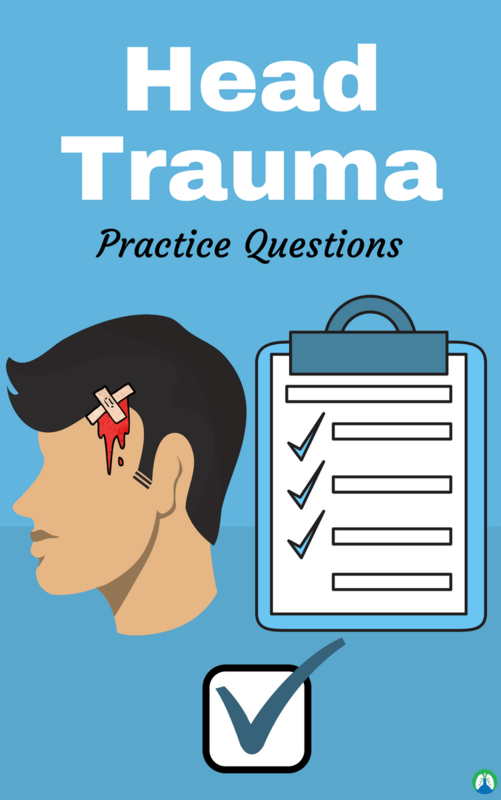 I hope that these head trauma practice questions were helpful to you. I’m confident that if you go through this study guide again and again, you will absolutely gain the knowledge you need to pass your exams in school on the subject of head trauma. Thank you so much for reading and as always, breathe easy my friend.